Beaducation: The Blog: We filmed Tornado Beads! 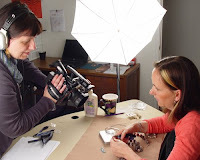 Kate & Lisa stepped into the Shootio last week and filmed one of Lisa's most popular classes, "Tornado Beads". This is a terrific, all-levels wire class. The resulting beads are really cool and you can use them in a variety of ways in your beaded and wire designs. Look for the class to launch in about three weeks or so. Here is a peak of Lisa & Kate in the shootio...check out that camera-work! TERRIFIC! I can't wait for this online class, and for the rest of the LNK projects to be re-added to the site! oooooh I'm looking forward to THIS class! Really looking forward to this class, when is it coming? ?